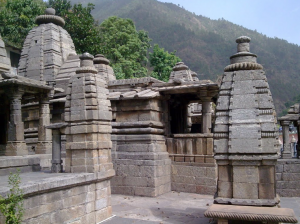 Another pilgrimage centre of importance is this group of 16 temples almost 16 km from Karnaprayag on the Chaukhutia-Ranikhet road. The main temple is dedicated to Narayan and has raised platform in the pyramidal form where the idol is enshrined. Sculpted out of black stone, the idol of Lord Vishnu is a metre high. It is believed that these temples,dating back to the Gupta period, were sanctioned by Adi Shankaracharaya. This place is situated quite far from the cluster of other four which form the Vishnu-Kshetra. Getting there: Jolly Grant at Dehradun is the nearest airport 192-km away Rishikesh is the railhead. Adi Badri si approachable from Karnaprayag, 16 km, which in turn is connected by a motorable route with Ranikhet, Nainital, Ramnagar also. TRH, Temple committee guest house, private hotel and dharamshala are available at Karnaprayag.